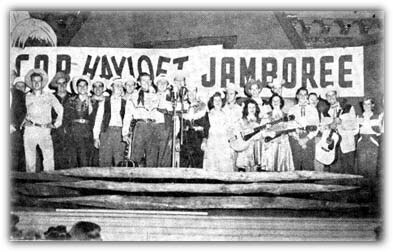 The General Manager of WCOP, Roy V. Whisnand wrote in a WCOP Hayloft Jamboree folio mentions that at one time they had three daily Hayloft Jamboree radio shows, plus a Hayloft Jamboree Network that reached all of New England. The afternoon shows was held in their main studio and was open to audiences. On weekends, they had special shows through out the greater Boston area. At that time, Ray Smith had just joined their staff, who was nationally known at the time and had recorded on the Columbia, London and Coral labels, with sales approaching the half-million mark. Eddie Zack and his Dude Ranchers were there, too, recording artists on Decca back then. He had a weekly NBC Network show that originated over in Rhode Island. "Coast to Coast, from Revere to Nantasket, the Hayloft Jamboree tonight." WCOP Hayloft Jamboree Back Row, Left to right: Dee Rogers (partially hidden), Lucky Shore, Lou Mondon, Eddie Fisher, Dave Miller, Ray Smith, Jim Senter, Carl (Ray Shact) Stewart, Bobby Bobo, Bill Dillon. Front Row, Left to right: Stuttering Steel, Chuck Young, Buzz Busby, Elton Britt (arm outstretched, Jack Clements (in derby), Country Al Green, Ruth Senter, the LeClair Sisters, Joe Val, Danny Gillis, Muriel White, Gerry Lee (Shore). Make no mistake about it - this music was hot there back then. They wrote that the demand for Hillbilly and Western music was such that it was 25% of all record sales in the East. If you were spining your radio dial when you were in New England back in the 1950's, then you looked for radio station WCOP out of Boston for hillbilly music. Around this time, Elton Britt became a permanent member of their show. Director of the show, you might recognize the name, Aubrey L. Mayhew. Besides Elton, the cast / staff included about 30 talented performers it was reported. 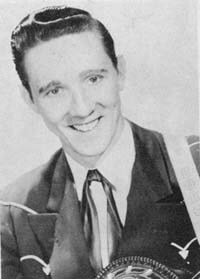 One was said to be Ray Smith, a former Columbia recording artist and was said to be among New England's favorite hillbilly singers. Carl Stuart was also a member and they said he got about 40 or 50 letters daily because of his original vocal style. The show also had the 'Betty Hutton of the Hillbillies', a really showperson by the name of Muriel White. The Hayloft also included three imports from the famed WWVA Wheeling Jamboree. 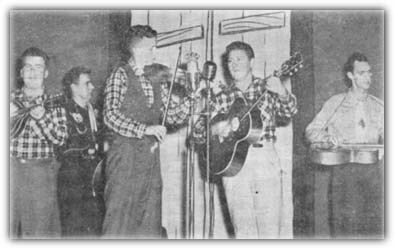 Buzz Busby, (Cowboy) Jack Clements and Scott(y) Stoneman, called The Bayou Boys. They were said to be real hillbillies with a great repertoire and their fiddler, Scott Stoneman, won first prize in many fiddling contests. Also a member was Jerry Devine, said to be a handsome looking boy and the owner of a terrific voice. He played the guitar, both lead and just strumming. 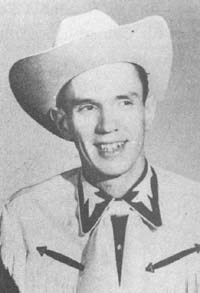 Until he joined the US Marines, a young Bobby Bobo appeared on the Hayloft Jamboree long enough to build a huge and loyal following. He was from Ohio and had his own radio show back there they said. He could sing anything - from ballads to hot numbers. The staff band was made up of Lucky Shore and the WCOP Ranch Gang. Each member was said to be able to play every instrument in the 'average hillbilly band' (now how would *you* define the average hillbilly band?). 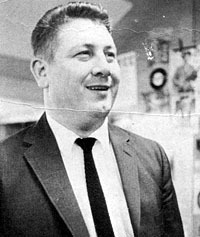 Jerry Lee and AL Grey were two of the smoothese changers around. Lucky was also one half of the show's comedy team. 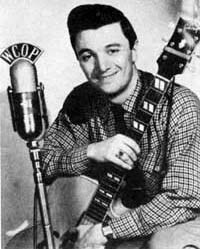 (is this the Jack Clements who produced Charley Pride early in his career?) and Ralph Jones. Rounding out the cast were Tootsie and Jackie, Dee Rogers, Dave Miller, Jimmy and Ruth, Doug Terry and his Roving Cowboys, Lucky and Elmo the 'Radio Rangers' and Lou Mondon. Most of the artists were said to have recorded on the Sheraton label. 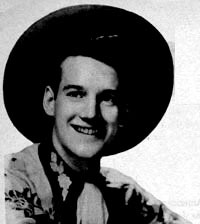 The director of the show, Aubrey L. Mayhew, was associated with country and western music for about 9 years prior to coming to the Hayloft Jamboree. He helped many big names up the ladder of success. He was director of the artist's service bureau at WCOP, produced the Jamboree and acted also as Artist and Repertoire (A&R) manager for the Sheraton record label. Then he also arranged the personal appearances of the top artists around the New England area.